I woke up yesterday morning starving. Not an unusual occurrence. It was my day off, so I drank my pre-requisite two cups of coffee in a leisurely fashion, then checked out the breakfast fixins‘. Hmmm…Pistachios and condiments. I’m a creative cook, but I’m not a miracle worker. And, since grocery shopping excursions on an empty stomach almost always end badly, I decided to eat out. So many places to choose from. 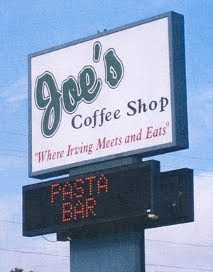 But yesterday I went to Joe’s Coffee Shop in Irving. Every city has a Joe’s. Memphis has The Arcade and Barksdale’s. Nashville has Sylvan Park and Athen’s Family Restaurant. 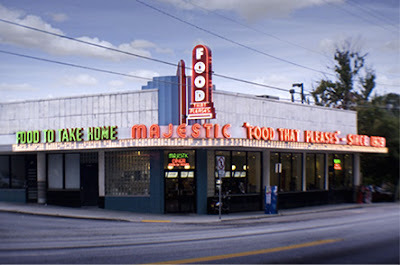 Atlanta has the Majestic Diner on Ponce. 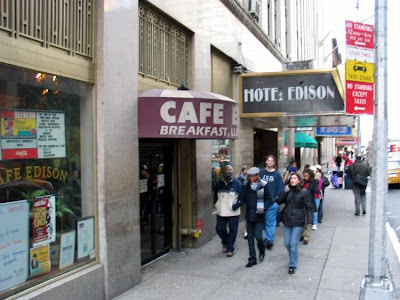 NYC has probably hundreds…my favorite being the Café Edison on W. 47th St…also known as “the Polish tearoom.” Breakfast at a neighborhood coffee shop isn’t an extreme dining experience…it’s a comfortable, everyday slice-of-life. Joe’s isn’t fancy, nouvelle cuisine…it’s just basic eggs, biscuits, bacon, sausage, pancakes, hash browns, grits, etc. It is what it is…simple food prepared well. What’s supposed to be hot is hot…what’s supposed to be cold is cold. The bacon is crispy, the biscuits hot and flaky, the scrambled eggs fluffy, the grits creamy, and the pancakes buttery and syrupy. The clientele is made up of mostly older people (yes, even older than I), who all seem to know everyone else in the room. They hobble in on their canes and walkers, greet each other boisterously, and then head for their usual tables or booths. There’s always a family or two, with a few kids running around. Dress code? “No shirt, no shoes, no service.” Otherwise, it’s a free-for-all of thick glasses, plaid shirts, big purses, and muu-muu’s. Joe’s is “where Irving meets and eats.” Or at least, that’s what it says on the sign out front. It’s not fancy enough to be hip and trendy, nor seedy enough to be a dive. But it’s bright and cheery, with windows that look out over the parking lot to Joan’s Spot Free Car Wash. And breakfast at Joe’s won’t break the bank. So why choose Joe’s, when there are so many places with more interesting fare, a more sophisticated clientele, and an infinitely better view? At Joe’s, I can just be me. I don’t have to be ashamed of my baggy shorts and hairy legs, my face sans makeup, or my skanky flip-flops. No one notices…no one cares. That’s not to say that I’m not noticed...or welcomed. I’m always greeted warmly with a “hey, young lady” or “good mornin’ hon.” The waitresses are friendly and efficient, and my coffee cup is never empty. The beauty of Joe’s is that I don’t have to dress to impress or “live up” to the ambience. I can just slide into a booth, drink coffee, eat breakfast, read the paper, and then go out and face the world with a full stomach and a smile on my face. Thanks Joe’s! Carol, I have to say that breakfast is my favorite meal for which to go out. If I had Joe's near me, I think I'd be there every day!